In order to subscribe or purchase MobiPos application, users will first need to sign up and create an account. To sign up, you could go to our CloudSync website or click here. Upon registration, you should receive email for activation. If email is not received, it might be due to invalid email entered. Do contact us if such occurs. If activation is done successfully, sign in to the respective account. Click on Branch that is located at the top navigation bar. The page will be directed as shown as below with all the outlets and its details shown. Next, click Manage under the "Billing" column. 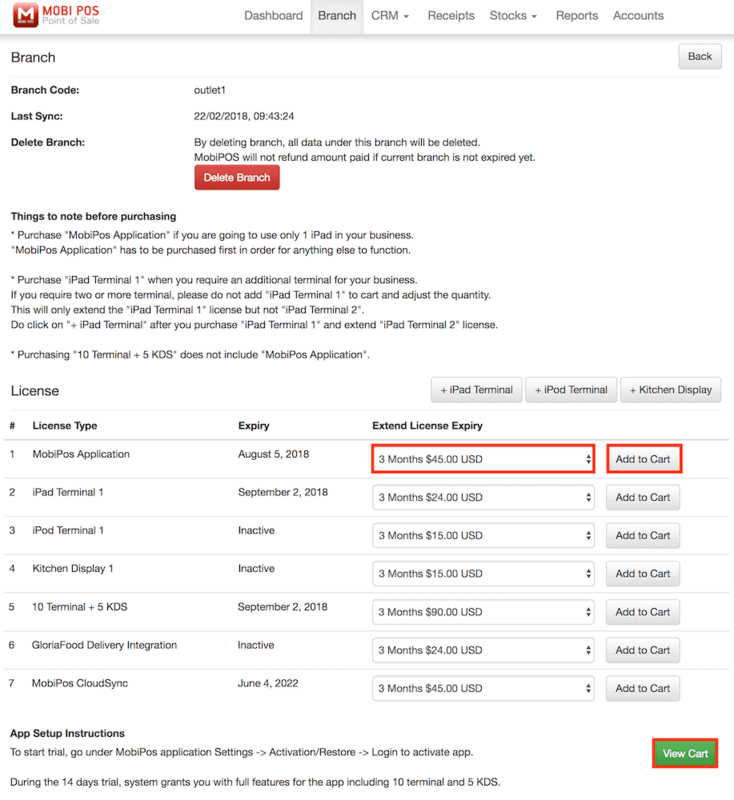 Upon clicking, users will get to purchase the desired license type as shown below. Under "Extend License Expiry", choose the desired subscription period, then click Add to Cart. Upon choosing the subscription period, it is important to Add to Cart as users will not be able to checkout if it is not done. Upon adding item to cart, a pop up page will be directed to PayPal for checkout. Currently we only accept PayPal checkout, however you could also use credit card on PayPal site without creating an actual PayPal account. * Do not change the quantity of the license in PayPal site as doing so does not reduce the price of license. 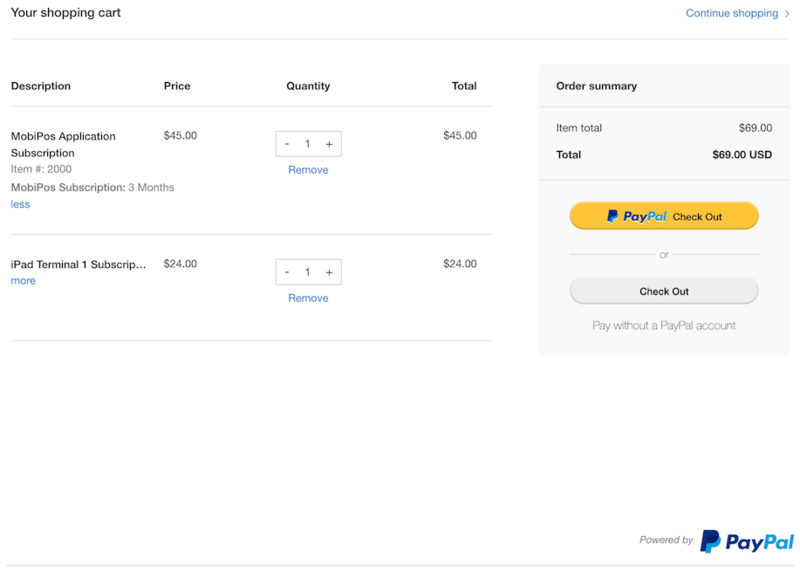 Click on View Cart if the PayPal checkout page is accidentally closed. Please note that each purchase is valid for one outlet only. Users will need to repeat the process of purchasing for each outlet. The license expiry date will only be extended after the transaction is approved. If there's no changes in expiry date, it could be due to failed transaction or the transaction under process. Please do not try to purchase again as we do not offer refund if license is purchased twice accidentally. Please contact us via email through support@mobi-pos.com if there is any enquiry.